In the 1950s, many local councils began to build estates of houses with gardens. 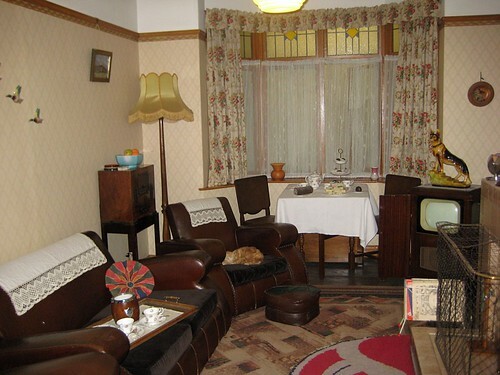 The houses were smaller than pre-war ones so furniture had to stack or be light enough to move about. This therefore led the introduction of: trolleys, sofa beds and ironing boards. Labour-saving devices powered by electricity became much more affordable. Jobs like washing, which had taken all day when done by hand, were now carried out much faster and more easily with the aid of a: washing machine, spin dryer and a flat iron. Refrigerators kept food fresh so that shopping did not need to be done every day. Convenience foods were introduced in the 1950s - tinned and frozen food, and even products like custard powder, made cooking simpler. The vacuum cleaner made cleaning the carpet a much easier task too. Many families had hot water from a tap for the first time and most homes now had their own bathrooms.